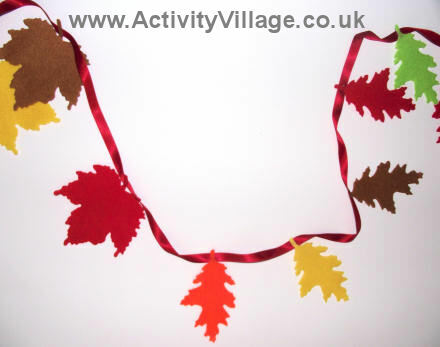 We've cheated with some pre-cut leaves to make this leaf bunting, but you can get the kids to cut out their own (using our templates, or perhaps tracing round some leaves that they collect from outdoors) for a fun Autumn craft and pretty display! Felt, paper or card scraps if you don't have pre-cut leaves, in reds, yellows, browns and greens. If you have pre-cut felt leaves, simply arrange them on the ribbon until you like the look of your display, and then glue them along the ribbon by the stems. 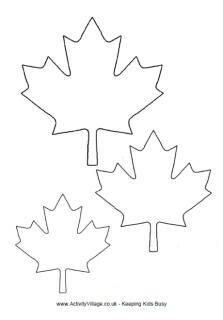 If you want to cut your own leaves, you can draw your own template, use our maple leaf template above, or go out and collect your own leaves to use to trace around. Make sure to include a stem. An adult could staple the leaves to the ribbon for an even quicker bunting. This doesn't have to be such a quick and easy craft! You could adapt the leaves in either of these two autumn craft ideas for a more special display, especially if you have a class or children who can contribute. These felt leaves are a simple way to teach children basic embroidery stitches as they get to see a quick result. We have stuck to basic backstitch as we are just starting out but you can be more ambitious if you like and experiment with other stitches.